After over a decade of professional organizing, I’ve encountered common organizing mistakes time and time again. These mistakes can be paralyzing, making it difficult (if not impossible) to get started or keep moving forward on your organizing projects. 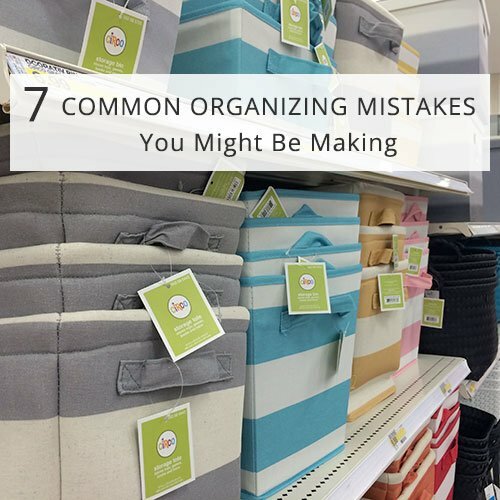 But the good news is this: once you know the most common organizing mistakes, if you recognize them in yourself, the fixes are really straightforward. So read on to discover 7 common organizing mistakes, and what to do about them. Organizing Mistake #1: Trying to find the perfect place to begin. Not knowing where to begin is a classic symptom of being overwhelmed by clutter. The trouble is, when you’re feeling overwhelmed, it’s hard to think clearly and make decisions. Add to this the desire to make a “perfect” decision, and it’s no wonder you’re feeling paralyzed. Instead of trying to find the perfect place to begin, start with some simple decluttering. Set a timer for fifteen seconds, grab a trash bag, pick a room and get started. Begin filling your trash bag with either trash or items you’re ready to donate to a worthy charity. When the timer dings, do a little happy dance. You’ve just begun! Organizing Mistake #2: Shopping for containers first. Containers can play an important role in pulling together an organized space, but it’s usually a mistake to make a trip to your favorite container store before you begin the organizing process. First of all, bringing containers into a cluttered space can just add to the messy look. Second, you may uncover (or empty) some perfectly good containers while you’re decluttering. And finally, it’s much harder to know which containers will solve your storage needs before you’ve started decluttering and organizing. The solution to this mistake is simple: shop for storage solutions a bit later in the organizing process. Organizing Mistake #3: Comparing your home and organizational challenges to others. This mistake can be one of the hardest ones to avoid, especially in this day of Pinterest. With just a few clicks of a mouse, you can find yourself staring at an abundance of pictures of seemingly perfectly organized spaces. Now there’s nothing wrong with seeking out organizing tips and inspiration. The mistake comes when you find yourself comparing your home to others’ and coming up short. If you find yourself doing this, remind yourself that everyone’s home, life and organizing challenges are different. You may be just getting started on your own organizing journey and that is fantastic! Embrace where you are and celebrate the fact that you’re moving forward. Then, simply define what looks and feels right for you, even if that looks different than the inspirational images you’ve been pinning. Organizing Mistake #4: Feeling overwhelmed by the midstream mess. This feeling, on it’s own, isn’t necessarily a mistake, but it can be the precursor to a big one. Maybe you’ve done this before? You pull everything out of your closet to begin organizing, but the midstream mess makes you want to run for the hills. Instead of running for the hills, however, in a moment of desperation you cram everything back into your closet, in greater disarray than when you began! The solution to this one begins with changing the meaning you assign to the midstream mess. View it as a sign of progress. You’re organizing! You’re on your way! If you do begin to feel overwhelmed by the visual clutter, take a deep breath, and don’t take anything else out. Instead, focus on decluttering some of the items that are already out. Collect items you don’t want or need anymore into a box or bag, and get them out of your sight. For example, put them in your car to take to the donation center. Organizing Mistake #5: Biting off more than you can chew. Once you get started organizing, chances are good you’re going to want to organize everything, and NOW. While this feeling of energy and momentum is fantastic, trying to bite off more than you can chew is a mistake. It’s much better to pace yourself, both in a single organizing session, and as part of your overall organizing plan. You’ll avoid burnout and overwhelmed feelings if you build in breaks and focus on one small project or area of your home at a time. Organizing Mistake #6: Believing a container holds the key to your organizing challenges. Containers play an important role in getting organized. However, there is no single perfect container that will solve all of your organizing challenges. Why is believing this a mistake? Because the hunt for the perfect container can keep you perfectly paralyzed. Look at containers as one piece of the organizing puzzle. Then, seek a versatile container that will work well for your application but has the potential to evolve and change as your organizing needs do. Organizing Mistake #7: Waiting to start until you have the perfect plan. As with all of the mistakes, the goal with this one is reasonable. You want to be efficient with your organizing efforts and not waste time or energy by doing things out of order, or having to redo them later down the road. But trying to craft the perfect organizing plan can keep you stuck for longer than necessary. It can be more efficient to plan and organize a little at a time. Then, plan a bit more and organize a bit more. I firmly believe that the best organizing systems are the ones that evolve over time—after you have a chance to use them, learn and tweak. Are you making any of these organizing mistakes? Others? I’d love to hear about it in the comments! Well… I think I’ve been ‘guilty’ of almost all of these. Probably not nbr 6 but the others, definitely! Having said that, comparing to others can also be inspirational. I have this one friend who has such a lovely and uncluttered home. All digital photos burned on yearly CD’s with an overview on the outside of the cases. Nice binders with clippings of party ideas, outings etc. Nice wallpaper on the inside of the closets, she can direct people to certain items within seconds. Very nice! The overwhelmed feeling does get less but there are still some hotspots – or should I say hotrooms- to desl with. Maybe during a new Organize-athon (hint-hint)? Great points, Petra! Thanks for the hint on the Organize-athon. We’ve been kicking that around and it’s likely that we’ll do it again…soon! I recognise 4 and 7 especially! There’s also the sheer overwhelm of thinking about it all in the first place. I’m not sure what an organize-athon is exactly but judging from the name, I’m in :). Thanks for sharing! Our Organize-athon is a weekend event that we will likely offer again soon. Participants gain access to a private section of our site (we use our online class system and offer the event like a “mini class”) and Aby is available to answer any questions along the way. Participants are free to choose the projects that they work on and we (along with other participants) are there to cheer you on and help along the way. Our last event was a big hit. It was amazing to see how much everyone accomplished and we received great feedback. So, stay tuned…we will likely do it again soon. We’ll announce it here on the blog as well as in our Weekly Quick Tip (you can sign up in the form above the comments section.) Thanks! Great list – thanks so much for sharing! Clutter has been my nemesis for my entire life and I really want to overcome it! I was wondering if I could get permission to share excerpts from this post on my own blog. I’m thinking just the major bold headlines and then refer readers here for the entire post and details. I would also be happy to promote your other products, classes, and blog in general. Thanks for asking! That will be fine. I will contact you by email to get it all set up. Thanks much! True – finding the perfect container doesn’t mean you’ll be more organized. Container or not, you will need to start somewhere. And its quite normal to be overwhelmed, especially if you start cleaning up everything. I start somewhere more manageable, start with the little things, like organizing one part of your closet. Then from there on, organize the next one and so on and so forth until you’ve organised the whole room, without even realizing it! My main organising hell is the bedroom baking trays and fridge/freezer in the kitchen. Just can get it right!! !